Obart Pumps has awarded its main delivery contract to the DX Group. UK-based pump supplier, Obart Pumps, has recently awarded its main delivery contract to the DX Group, a courier and logistics company with operations throughout the UK and Ireland. Obart Pumps has been in business for over 40 years and delivers more than 2000 products every month across the UK, and that number is growing month on month. Among other products, the company supplies submersible pumps, hand pumps and flood products and knows how important it is to keep the supply chain, the lifeline of the sales process, working well. Simon Baldock, finance director of Obart Pumps said, "At Obart Pumps, we take the sales process very seriously. From the moment a customer calls, through to delivery, we strive to give our customers a world-class service, and that's what keeps them coming back. 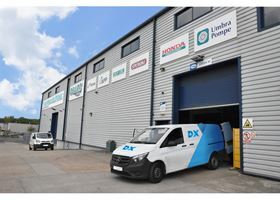 In the past, we have struggled to find the right delivery solution.” He added that unreliable service levels create a frustrating situation for the company and its clients, hence the decision to go with the DX Group. "DX seemed to be the right choice moving forward. They have over 40 years in business, a reliable delivery process and are very much customer focussed”.